Found by a group of 80's & 90's who love life and advocate science. Amico devotes to offering green, safe and smart life. All of our designs are inspired by our everyday life and customer feedbacks. Our company insists the quality check throughout, to provide good lighting products is always our mission. Eye Care: No UV rays,Reduces fatigue, which sometimes may lead to tearing from eyes and headaches. Anti-Flicker: The LED lamp is made to be flicker-free, thus reducing eye disturbance while reading. Glare Reduction: Reduces direct and reflective glare on reading materials. Provides optimal lighting, thus makes reading,working and playing more enjoyable and comfortable. Longer Bulb Lifespan: With LED technology, LED bulb is made to last longer than normal light bulb or fluorescent light tube. Caution:Before installing,be sure to turn off the power to avoid the electric shock. Note:Please do not rotate light headfiercely to avoid being destroyed due to limit of rotated angles. ★Adjustable Swing Arm Lamp - Rotating base, hinged arm and swiveling LED panel helps you manipulate the lamp head in multiple-angles. 14.1+14.5" extendable long arm can be folded to 16.5" . 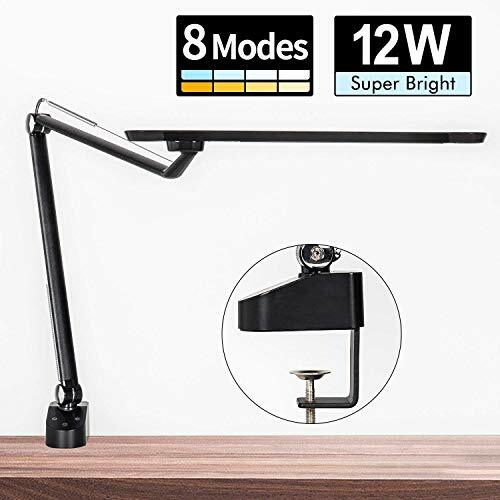 ★8 Lighting mode and Gradural dimming - This LED desk lamp allows to choose among 8 COLOR MODES and adjust the BRIGHNESS to suit your lighting needs. You can choose a soft yellow light as your bedside table, or you can choose intense white light for office as well. Meanwhile warm color natural light resembles like incandescent lamp and halogen lamp which are pleasant for your eyes. ★Space Saving Clamp Design - The toughness of this metal clamp lamp can support up to 1.6"/4cm(max) thick desk. Also, this design can help save the desk space, extraordinarily suitable for reading, office, art workshop, architect, etc. ★Easy to Install - Strong metal clip-on clamp, suitable for reading,office,art workshop,architect.Perfect for lighting up large wide work areas and tables. With LED technology, LED bulb is made to last longer than normal light bulb or fluorescent light tube. ★Excellent After-sales Service 5-year Warranty - If you are not satisfied with this product please send it back to us within 3 months, our 24 x 7 customer care will ensure with high priority service. If you have any questions about this product by Amico, contact us by completing and submitting the form below. If you are looking for a specif part number, please include it with your message. Lamp-In-A-Box TRI-TRV-NEWBI Travel New Harbor, Block Island Postcard Tripod Lamp, 8" x 8" x 14"
Lamp-In-A-Box TRI-TRV-UNION Travel - Union Jack Tripod Lamp, 8" x 8" x 14"
Lamp-In-A-Box TRI-TTN-VTGPL Transportation - Vintage Plates Tripod Lamp, 8" x 8" x 14"